Max. 28 characters on line. The FORM MAKER can create a custom official-looking legal form to fool your friends... and enemies! 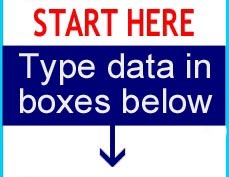 Just add a couple lines of data, click "create", then save, then print. STEP 2: Use the spacebar to move the text left or right. STEP 3: After you have typed in your text and aligned it, then click CREATE. Your form will appear below along with a link code to the image for future reference. If the message is not worded or aligned correctly, you can go back to steps 1 and 2 and then click CREATE again. TO PRINT: RIGHT click your mouse on the image below and save it as a PNG file to your computer, then open and print it to full page size. All done!